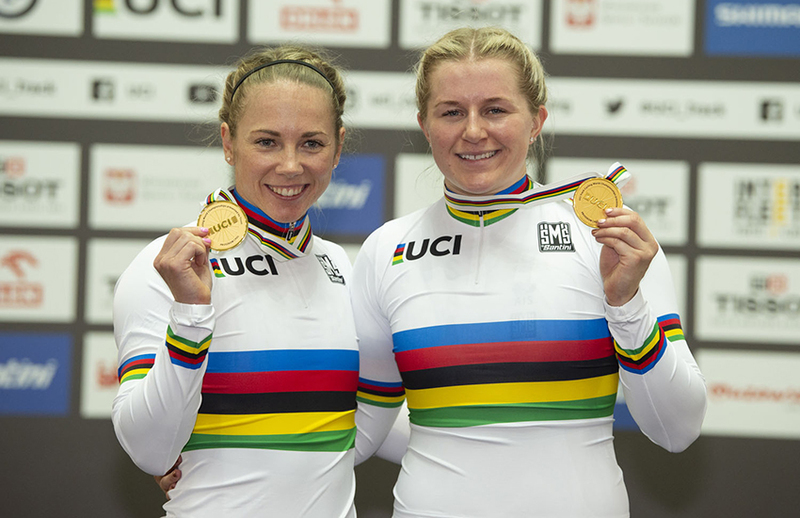 Having already lowered the Australian Record twice in the past twelve months Kaarle McCulloch and Stephanie Morton lowered it again to within touching distance of the World Record as they claimed Australia's fourth world title in the women's team sprint at the 2019 UCI Track World Championships in Pruszkow, Poland. "I am speechless, and it takes a lot for that to happen. It is pretty surreal, we had pretty high expectations tonight, and we have absolutely exceeded them. Gold was just a bonus," said Morton who claimed her first elite world title having been a former Para-cycling world champion as a pilot. After setting the fastest time in qualifying of 32.492 secs McCulloch and Morton improved to post a time of 32.368 seconds in the first round beating China to book a spot against Russia in the ride off for gold. Despite a strong challenge from Russia in the final McCulloch's opening lap of 18.548 seconds saw Australia take the early leave by over three tenths before Morton brought it home stopping the clock in 32.255 seconds, a New Australian record and just over two tenths from the world mark. For McCulloch it was her fourth team sprint world title and make her the second most decorated rider in the women's team pursuit at world championship level with four gold among seven medals. "We just got better and better with every ride. We were a bit nervous to begin with, but we just kept focussing on our processes which is what we were here to do," said McCulloch, who claimed her first world title on this very track in 2009. "We are really proud, and happy that this is all building towards Tokyo. This is a nice step in that direction we will take a lot of confidence out if this."